The Communion Veil: Where Does Evil Come From? 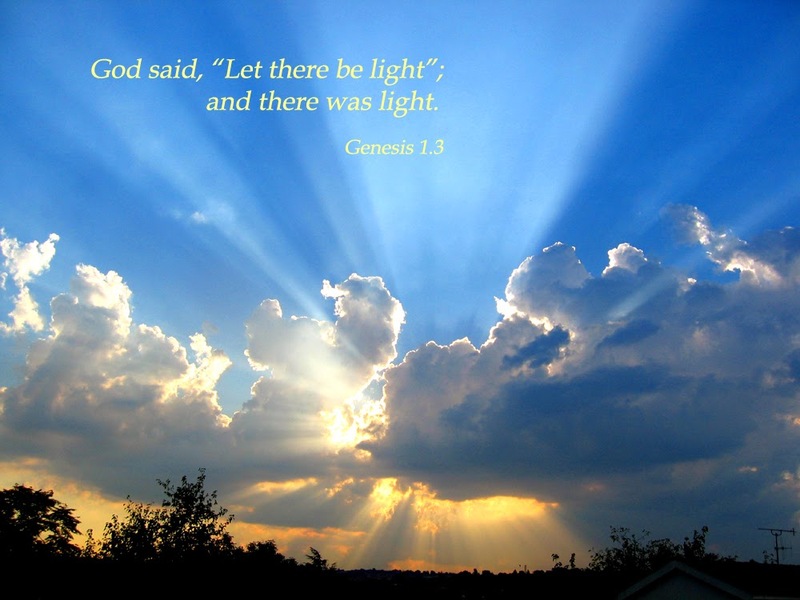 In the beginning God Said, "Let there be light." And there was light. God creates with His word, and when He gave the angels free will He also gave them this ability to create out of their words, although to a much lesser degree. God is all good, there is no darkness in Him. However, having infinite knowledge of all of His creation, He knew of evil as a concept (because God knows all things), but at this time evil only existed in the mind of God as a concept, a potentiality. When he gave the angels free will they two had a knowledge of what rebellion was, and again evil was just a concept. This knowledge was given for otherwise their will would not be free because they would have no other choice but the good God. To truly choose God freely, they were given knowledge of "another way" and the fearful freedom to choose. Again, this was only a concept in the mind of God and the angels, at this time evil did not yet exist. God did not create evil, even though He knew about it. 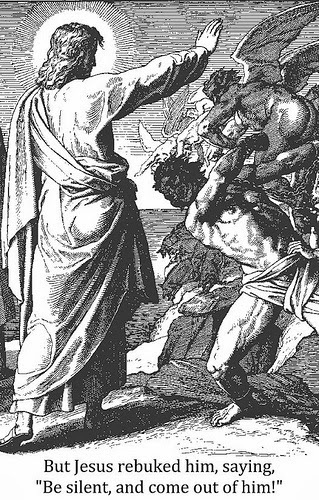 By his pride and arrogance when Lucifer rebelled against God, his words were, "I will not serve." Lucifer spoke rebellion and evil into existence by these words. (This is why obedience of mind and heart is such a powerful weapon against the evil one.) Rebellion and all that is evil is the sole creation of the evil one. Then Michael the Archangel spoke, "Micha'el! Micha'el!" or "Who is Like God!" By this St. Michael spoke in defense of God out of love for God. 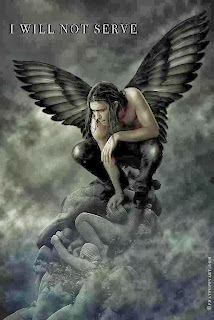 He had no fear of what the other angels would think! 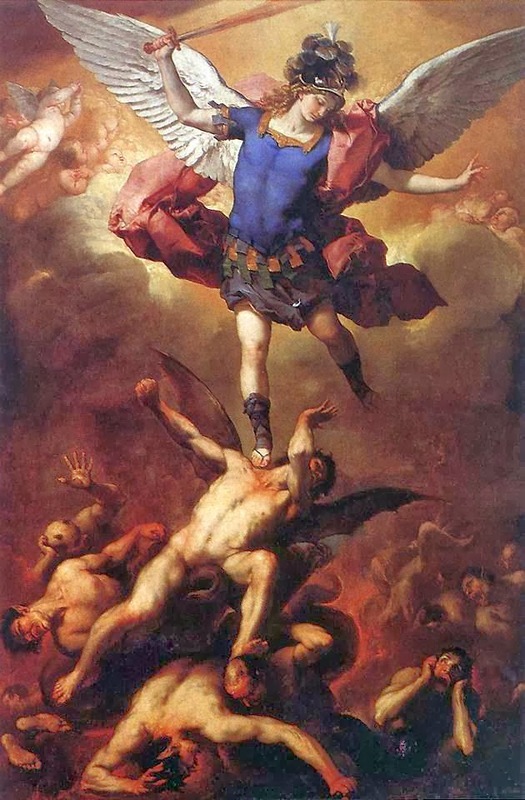 By the power of God, Saint Michael was given the voice that would cast Satan out of Heaven. 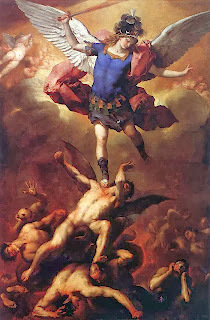 By the words of Saint Michael every faithful angel in heaven was put to our defense if we would so call upon them. These angels would protect and defend God's creation in complete obedience to God, which includes us. This is why when Jesus encountered demons, the first thing He ever said to them was, "BE SILENT" He was taking away the demon's power to create any more destruction by his speech. First He silenced them, then He expelled them. Think about that. What comes out of our mouth, if evil, defiles us. Of course it does! Isn't that what happened to Lucifer? He spoke rebellion, and by doing so, his heart and his whole being was made evil by his speech. He didn't become 'partially' evil, no, he was made wholly evil and no part of him could remain in heaven. All of this from just four words..."I will not serve." What do you speak? Do you curse regularly? Do you laugh and joke when something bad happens to someone that you know, delighting in someone else's misery? Or do you gleefully tell everyone around you someone else's misgivings. We must be VERY CAREFUL with what we speak. Speech is to inform, encourage, uplift and instruct...doesn't that sound like what Jesus did? We should never be afraid of what is evil, God has all power over any evil. Evil was not within his range of creation, but it is always within His domain to hinder or stop it according to His will, our faith, prayer*, and of course His mercy. *This is also why spoken prayer can be so powerful. Your post is so thought provoking. It makes you look at life's events in a new light. Jesus is our protector, His angels surrounding us and guarding us at all times. You are so right about obedience of mind and heart. Obedience is so powerful. It is one of the most beautiful ways that we show our love for Jesus, who said, "If you love me, keep my commandments." God bless you for this beautiful post and all of the other beautiful work you do for Our Blessed Lord!